A cold abscess is a slow accumulation of pus occurring without the inflammatory reaction that causes pain, heat or reddening of the skin which are typical of an ordinary abscess. A cold abscess tends to become diffused into adjacent tissues owing to the pressure of the pus, and to form a wandering abscess. Cold abscess is almost synonymous with tuberculous abscess, but there are other causes, in particular deep mycotic (fungal) infections. The psoas muscle arises from the lateral aspects and transverse processes of the vertebral bodies from T12 to L5, as well as from the intervening disks. Infection readily spreads to the muscle from contiguous vertebrae. The psoas muscle runs under the inguinal ligament and attaches to the lesser trochanter of the femur - a psoas abscess often presents as a mass below the inguinal ligament. The patient was an 11 year old girl. 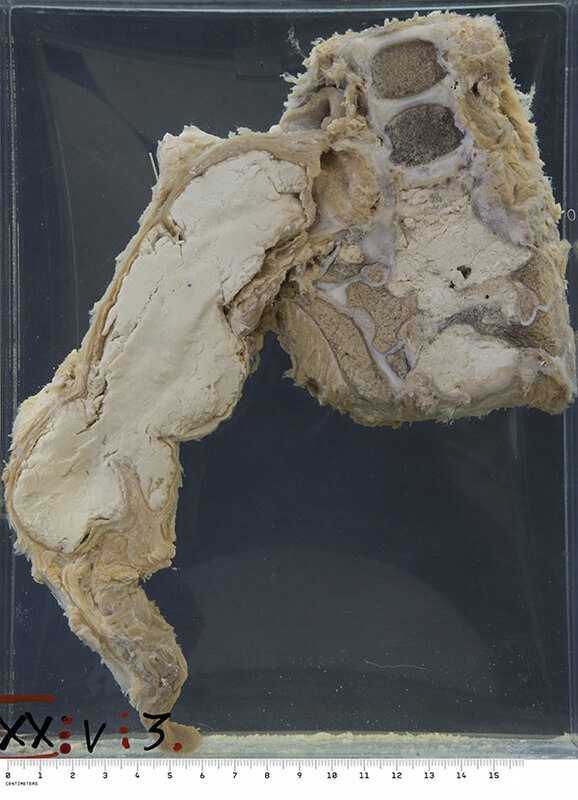 Autopsy findings included a calcified tuberculous focus at the right lung apex, and this psoas muscle abscess.